Varicose veins are dilated leg veins that protrude from the skin. These bulging veins on the legs can cause discomfort, especially while standing. Such varicose vein symptoms can be treated at the premier varicose vein center in Northern Colorado, Total Vein Care, specializing in varicose vein treatment. 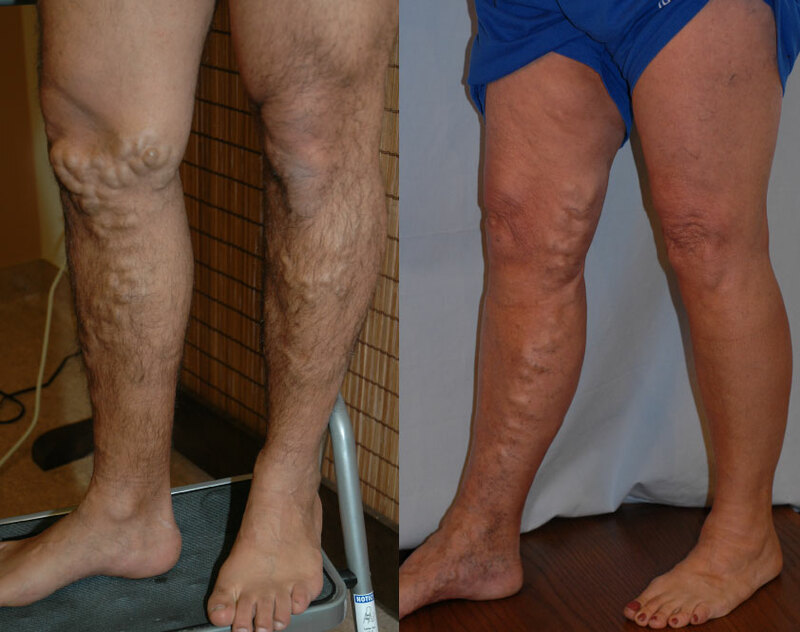 Painful varicose veins can be eliminated quickly and comfortably in our office, using cutting edge technology. All procedures are carried out with local anesthesia and recovery requires no downtime. Varicose veins are defined as dilated veins, 3 mm or more in diameter, when measured with the patient in the standing position. They may involve any of the superficial veins, such as the saphenous veins, and tributaries. Although superficial veins which become dilated or aneurysmal are considered varicose veins, what we usually think of are the tortuous, twisted bulging veins that form as a result of high pressures in the superficial veins of the legs, seen in chronic venous insufficiency. In the clinical progression of chronic venous disease, varicose veins are considered clinical stage 2, or C2, after spider veins which are C1. Weakness of the vein walls that leads to dilatation and loss of function of the valves in the superficial veins also leads to ballooning of the veins in the lower legs. These dependent veins bear the brunt of the venous hypertension when a person is erect. Before and 2 weeks after endovenous ablation without phlebectomy. ​Although some people who have varicose veins are not symptomatic, many demonstrate “venous discomfort.” Symptoms of tiredness, heaviness, and fatigue often evolve into aching pain, the most common symptom. Patients also complain of itching, burning, or tenderness over a vein. Restless leg syndrome can be produced by venous hypertension among many other conditions. The symptoms of venous disease worsen with prolonged sitting or standing and improve with exercise or elevation of the legs. Because inflammation of the vein and surrounding tissues develops with progression of venous disease, anti-inflammatory medications such as ibuprofen also provide relief. Compression stockings can provide symptomatic relief by making the calf muscle pump more efficient at lowering pressure in the veins. Therefore, their effect is most profound during walking and exercise. Compression stockings do not permanently alter the course of CVI. Varicose veins without any of the symptoms mentioned above are considered a cosmetic issue. When significant symptoms develop and compromise a person’s quality of life, the problem becomes medical. 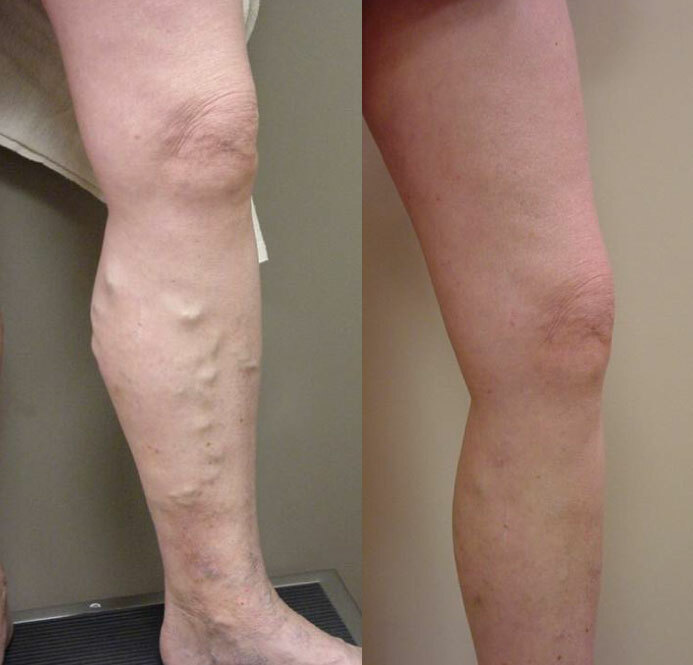 A TCV patient before and after 2 weeks of treatment of varicose veins.